…prostate cancer accounts for 36% of all male cancers in the United States and 13% of all cancer related deaths in men… – Duke K. Bahn, M.D. Adenocarcinoma of the prostate is the clinical term for cancer that begins in the glandular structure of the prostate. If identified while it is confined within the prostate, the cancer can be treated successfully. The longer prostate cancer is ignored, the greater the chance that it will metastasize (spread), first locally to tissues around the prostate, or seminal vesicles (saclike structures attached to the prostate), then to other parts of the body, such as lymph nodes, bones, liver and lungs. 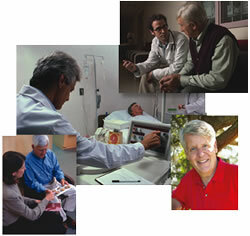 Prostate cancer is becoming an increasingly important public health concern. The second leading cause of cancer death in men in the United States, its impact is roughly equivalent to the affects of breast cancer on women. Cancer of the prostate is the most common form of malignancy in men—approximately one in nine will develop the disease. In spite of this alarming fact, many men are unaware of the dangers, and the lack of immediate symptoms creates a false sense of security. Early detection and intervention of progressive prostate cancer may help decrease the 30,000 prostate cancer-related deaths each year. Treated in its early stages, prostate cancer is highly survivable.